Pre-meeting donuts and coffee generously supplied by our hosts, Gerald Custer and Mary Whittmore. 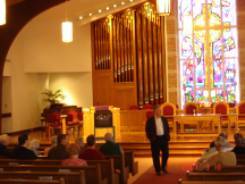 Jerry Custer introduces the video about the organ selection and resulting sanctuary renovations. Mary Whittmore demonstrates some of the Reuter-Rogers intricacies. 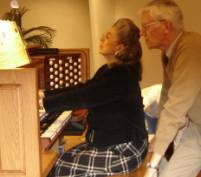 Dorothy Holden plays for Jim Wilkes and Mary Whittmore. A look inside the organ chamber. 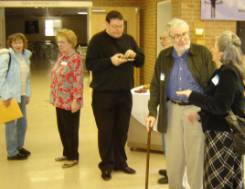 Chapter President Carl Balduf called the March 10, 2007 meeting of the Michigan Chapter of the Organ Historical Society to order at 9:35 a.m. at the First Presbyterian Church of Farmington, Farmington Hills, Michigan. 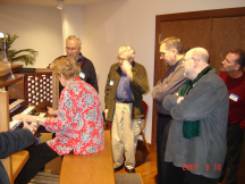 Present were Carl Balduf, MaryAnn Balduf, Gerald Custer, Dorothy Holden, Ken Holden, Allen Hunter, Jasper Pennington, Steve Schlesing, Mary Whittmore and James Wilkes, plus new member Chris Frith and guests Ronnie Baker, Ralph Bolz, Larry Gage, Charlotte Fallis, John Retich, Sallie Wisecarver, Del Wisecarver and Ruth Wrens. The minutes of the October 28, 2006 meeting were approved as presented on the Chapter Website and in hard copy at the meeting. Balduf then presented the Treasurer's Report as submitted by Treasurer Terry Jankowski, who was unable to be present. The Report is posted below. Balduf then discussed dues status and called for payment of 2007 dues as soon as possible. Following the reading of an email from Stephen Schnurr, O.H.S. National Secretary, regarding chapter bylaws issues, a discussion followed to gain the sense of the membership present. It was agreed that Michigan Chapter bylaws should be as simple and uncomplicated as possible and the 501C(3) status should not be considered, since we do not see a present need for accepting tax deductible charitable contributions. Balduf agreed to write a draft set of bylaws and consult with Mr. Schnurr about them. Balduf will also investigate the formation of the Chapter as a non-profit corporation in the State of Michigan. A discussion then followed, concerning recruiting and membership issues. Suggestions were made for several approaches to publicizing the Chapter, all of which were deemed good enough to execute as the season progresses. Following a benediction by Chapter Chaplain Fr. 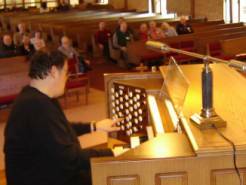 Jasper Green Pennington, the meeting was adjourned at approximately 9:55 a.m., followed by a presentation, by Gerald Custer, Director of Music and Mary Whittmore, Organist about the Reuter/Rogers Hybrid Organ at the First Presbyterian Church. The presentation began with a videotaped interview of Dave Martyn, Chairman of the Organ selection committee. He related how the decision for the organ was made and how the renovation and architecture of the sanctuary was executed with the organ in mind. 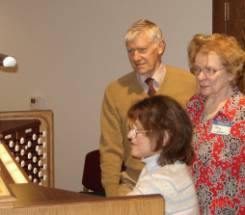 Following the videotape, Mary Whittmore demonstrated the organ, answered questions and then invited others to play. Following the demonstration, the consensus was that this is the finest and most convincing hybrid the group has ever heard. 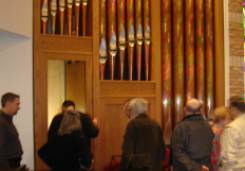 Many thanks were offered for the opportunity to visit the church and hear the organ. Members of the group then enjoyed an excellent lunch at the Brass Pointe Restaurant in Farmington Hills. MaryAnn Balduf and Jim Wilkes.